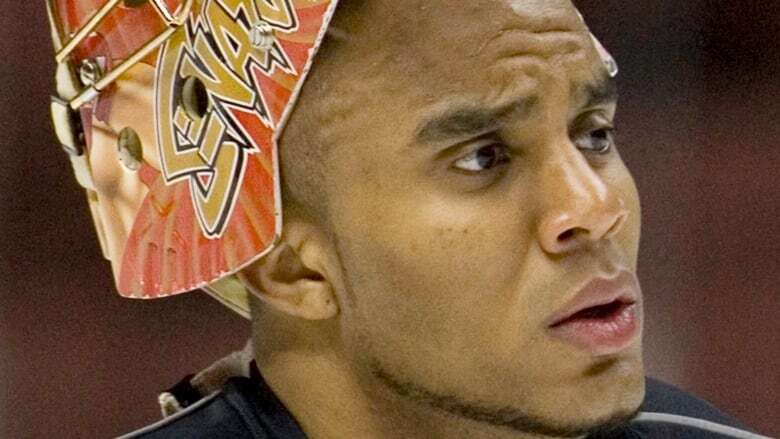 Ray Emery was giving back to Hamilton and playing the game he loved the night before he died. The ex-NHL goalie was one of several current and former professional players who hit the ice as part of Hockey Night in Hamilton, a charity game that raised funds for Food4Kids. The game was organized by Zac Rinaldo, left winger for the Nashville Predators, who also calls the city home and was teammates with Emery when he played for the Philadelphia Flyers. "It's just nice to know the last time people saw him he was doing something he loved, giving back to the community and taking pictures and signing autographs for kids," said Rinaldo. Emery was on fire during the game, "stopping pucks left and right" according to Rinaldo, who said the other players were talking about how the goaltender who played parts of 11 seasons in the NHL still had it. Just hours later, while swimming with a group of friends in Hamilton harbour around 6 a.m. Sunday, he went under and didn't resurface. An autopsy completed Monday confirmed drowning as Emery's cause of death. Police say Emery's death was "non-criminal" and have completed their investigation. With nicknames like "Razor" and "Sugar Ray," Emery was known to use his fists more often than your typical netminder. Rinaldo remembered one game from 2013 where Emery, then the Flyers goalie, raced across the ice to take on Braden Holtby from the Washington Capitals. The bout turned into a line brawl that left multiple players from both teams swinging. "Ray didn't want to be excluded from that rough and tough stuff just because he was a goalie," explained Rinaldo. "He wanted … to enjoy all aspects of the game." In another famous fight, Emery took on Martin Biron of the Buffalo Sabres, with a big smile on his face as he whaled on the other team's goalie. "To be a goalie in the National Hockey League takes big balls, and he had probably the biggest set of balls I've ever seen on anybody," said Rinaldo. But it wasn't all flying fists and knockout bouts. During his professional career, Emery was known as a loyal teammate who helped the Senators reach the Stanley Cup Finals in 2007 and even won the Stanley Cup as a backup for the Chicago Blackhawks in 2013. That loyalty extended off the ice, too. Rinaldo said his former teammate was always willing to drop whatever he was doing to come out and support Hamilton. "He was nothing but a class act. He was very humble, he was very approachable, very down to earth," said Rinaldo. "He was always smiling and making kids happy." Katherine Hedley, secretary for Cayuga and District Minor Hockey, said the league was where Emery first got his hockey start. "He never forgot where he came from. He was very humble," she said. Hedley told CBC News that in 2013, Emery contacted her and asked if she could help him bring the Stanley Cup to Cayuga. Hedley says his stipulation was that he wanted to make sure the Cayuga minor hockey players got an opportunity to see the cup and to meet him, because he wanted it to be about the kids. "He's generous with his time, [making] himself available to help the younger hockey players," said Hedley. Daniel DiFrancesco, 30, of Hamilton first met Emery three years ago at a Hamilton golf club and developed a friendship through the game. They went on trips together. He spoke to Emery last week and said Monday he's still in shock that he won't be able to pick up the phone to see how his friend is doing. "Ray's just got such a big heart. He cares about everyone before himself. He's so selfless," said DiFrancesco.